I frequent the Olive Cellar in Appleton. This is a specialty olive oil and balsamic vinegar store. My favorite oils are the Tuscan Herb and Blood Orange Olive Oil. My favorite balsamic vinegar are the Espresso, Dark Chocolate and Tangerine. I have had the Blood Orange Olive Oil cupcakes on my list of things to do for a long time. Today was the time to do so. I found this recipe on Food Network. It went over quite well in our home. Preheat oven 350 degrees. Place paper liners in a 12 cup muffin tin. Blend together the flour, baking powder and salt in a medium bowl to blend. Using electric or stand up mixer beat the sugar, eggs, and orange zest in a large bowl until pale and fluffy, about 3 minutes. Beat in vinegar and milk. Gradually add oil. Add flour mixture and stir until blended. Fill muffin tin almost to the top of the paper liners. Bake until golden on top and a tester inserted into the center of the cake comes out with moist crumbs attached. About 20-25 minutes. Transfer to wire rack an cool for about 10 minutes. Remove muffins onto a platter and let cool. Sift powdered sugar over muffins. I also made topped the cupcakes with orange glaze (see below) and chocolate ganache. Variety is the spice of life, right?! As always, simple and delicious!! Whisk together and spread on cupcakes. We had a spicy Sunday. Chimichangas, tacos, green chili and Mexican Hot Chocolate Cupcakes. It was simple and DELICIOUS! 1. Whisk flour, almond flour, cinnamon, cayenne, baking soda and salt in a bowl. Set aside. 3. In a large bowl pour warm milk over unsweetened cocoa, whisk until smooth. Let cool slightly. 4. Add sugar, oil, egg and vanilla to whisked cocoa/milk. Whisk all until smooth. 5. Whisk in the dry ingredients until combined. 6. Divide the batter among the 12 muffin cups. Bake until the tops spring back, 20-25 minutes. Transfer to a rack and let cool for 5 minutes in the pan, remove the cupcakes to the rack to cool completely. Mix all together in stand up mixer or food processor. Frost cupcakes and top with cinnamon and grated chocolate. Oh my goodness. Simple and absolutely DELICIOUS! How many times have you bought rice pilaf in a box? Once you make this recipe you will not want to buy a box again! Melt butter in large saucepan over medium high heat. Cook onion and 1/2 teaspoon salt until just softened, about 3 minutes. Add rice and cook, stirring frequently, until edges begin to turn translucent, about 2 minutes. Add garlic, thyme and bay leaf and cook stirring constantly, until fragrant. About 30 seconds. Stir in broth and bring to a boil. Cover, reduce heat to low and cook until liquid is absorbed, about 20 minutes. Remove from heat and let stand, covered for 10 minutes. Discard bay leaf and fluff rice with fork. Stir in almonds. Season with salt. Serve. So simple, delicious and takes no time at all. Enjoy!! Preheat oven to 325 degrees. Place rack in center of oven. Have ready an 8 inch square baking pan that has been lined with foil. Add flour, baking soda, salt and sugar and stir until all the fruit and nuts are completely coated with the flour mixture. Make sure to separate any clumps of dried fruits. In a separate bowl, beat (with a wire whisk or electric mixer) the egg and vanilla until light colored and this. This take about 3-4 minutes using an electric mixer. Add the egg mixture to the fruit and nut mixture and mix until all the fruit and nut pieces are completely coated with the batter. Evenly spread into your prepared pan, pressing to compact the batter. Bake for 35-40 minutes or until the batter is golden brown and is just starting to pull away from the sides of the pan. Lift the bars from the pan using the edges of the foil. Use a sharp knife to cut into squares or bars. You can store up to 10 days at room temperature or longer if refrigerated. Believe me, these are simple and delicious. You must give them a try. Enjoy! Preheat oven to 325 degrees. Line the bottom and sides of an 8″ square baking pan with parchment paper (you could use foil too, I use parchment). Combine the butter, sugar, cocoa and salt in a medium heatproof bowl and set the bowl in a wide skillet of simmering water. Stir occasionally until butter is melted and all ingredients are combined. The mix should be hot enough you want to remove your finger when you test it. Remove the bowl from the skillet and set aside until warm. Stir in vanilla with a wooden spoon. Add eggs one at a time, stirring vigorously after each one. When the batter looks thick, shiny, and well blended add the flour and stir until you cannot see it any longer. Beat for 40 strokes. Spread evenly in the lined baking pan. Bake 20-25 minutes. When you put a toothpick in middle it will be moist. Don’t overcook. Do not leave in more than 25 minutes. Let cool on rack. Lift up the ends of the parchment and transfer to cutting board. Cut into squares. 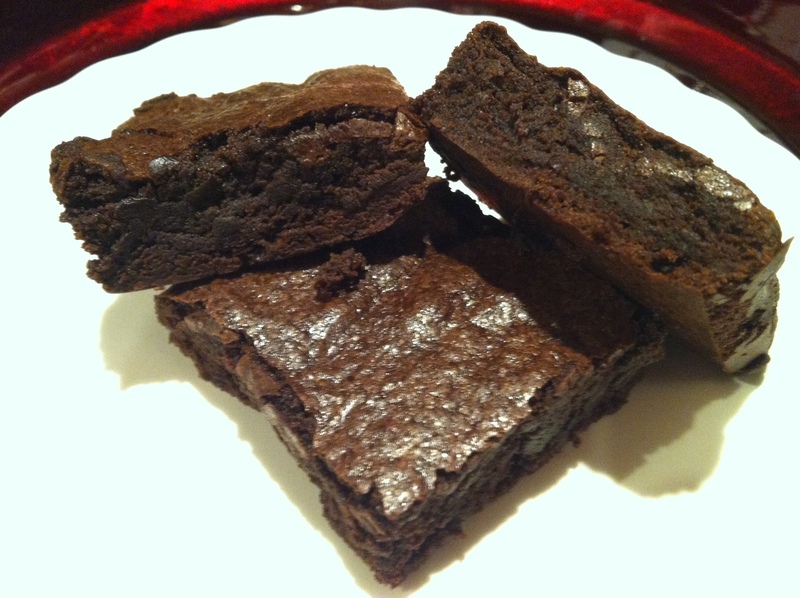 These brownies can be prepared, baked and eaten in less than an hour! Enjoy!! I originally posted about these cookies 4 years ago. Rachel and I made them for Christmas. We had fun baking cookies and her and Eric had fun decorating them. Fast forward Valentine’s Day 2016. Thought I would make them today along with some simple brownies. Can’t have Valentine’s day without chocolate, can we? However, a little spice is nice too. On low speed cream the sugar and butter until combined. Add the eggs and molasses and mix until combined. Add the flour, baking soda, salt and spices and mix on low speed until combined. Remove the dough from the bowl and wrap in plastic wrap, place in refrigerator for 1 hour. Line cookie sheets with parchment paper. Allow the dough to sit at room temperature for 15 minutes. Take about 1/2 cup dough and roll out on a lightly floured board until about 1/8 inch thick. Cut out with gingerbread cookies cutter. Place on parchment lined cookie sheet. Bake for 10 minutes. Rotate halfway through baking. This is a simple and delicious recipe. Serve with salad, rice, potato or veggie. Whatever works for you. Takes under an hour. Great for a weekday meal. Coat chicken in balsamic vinegar and olive oil. Add rosemary, salt and pepper. Let set for 10 minutes. Heat a medium non stick skillet over medium high heat. Do NOT add any oil. Add chicken breasts and cracked garlic to pan. Cook chicken 4-5 minutes each side. I only turned once. Transfer to a baking dish. I placed in 350 degree oven and baked for 15-25 minutes, depending on how thick the breasts are will depend on baking time. The chicken breasts were so flavorful and moist. This time I served with mashed potatoes and garden salad. Another simple and delicious meal. Enjoy! Prior to making the burgers make the sauce. Mix all the sauce ingredients together. Place in refrigerator before serving. Serve “slider” burgers on Hawaiian rolls or make these. I also baked some rustic rolls that I have to add to my blog. These rolls are a huge hit in our home and never last through the night. I will post that recipe soon. Everyone enjoyed the sliders. You have to give these a try. No bison? Use ground beef or whatever ground meat you like. They will taste delicious and the sauce is a great condiment. ENJOY!